Community Christian School’s Student Leadership Institute’s director, Judy Klein, saw a need in a former student of hers and CCS graduate, Ryan McLeod. 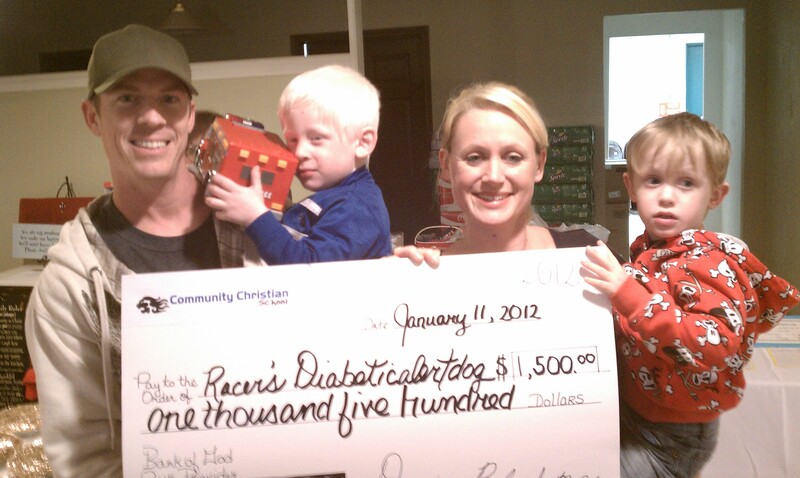 Ryan McLeod, left, and his family are blessed with donation for son, Racer, from Community Christian School in Orange. severity of his illness, Racer is in need of a diabetic alert dog. Based on Rachel’s Challenge, the students of CCS have started a Chain Reaction club and are implementing the challenge in their chapel and Student Leadership Institute program. This week the entire school is having a “Chain Reaction” week where each day they are focusing on a different act of kindness. Klein, as part of the Chain Reaction, wanted to show an act of kindness toward the McLeod family. She presented the need of the McLeod family to the student body during their chapel and they rallied together to raise money throughout one week to help with the purchase of the diabetic alert dog. The students were impacted by the need of the 4-year boy and raised $1, 500. Together with the money raised by Community Christian School in Orange and the money raised by the community and surrounding areas at the benefit at Precision Autobody in Nederland on Feb. 11, the McLeod family now has the money to receive a diabetic alert dog for Racer. The CCS family is so blessed to be a small part of helping Racer McLeod. One of the outstanding female vocalists of all time had roots in the church and continued to profess her faith in Jesus Christ until her tragic death at age 48. 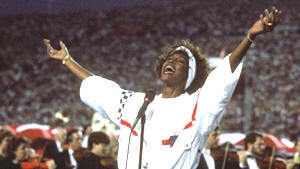 Whitney Houston sings "The Star-Spangled Banner" at Super Bowl XXV in 1991. In a rare appearance on “Primetime” Dec. 4, 2002 with Diane Sawyer, Houston revealed her struggle to overcome drug addiction, which involved a spiritual battle for her heart. Houston admitted she had used alcohol, marijuana, cocaine and pills in the past, but said the biggest “devil” was not the drugs, but herself. “It’s my heart. It’s what I desire, what I want and what I don’t want. Nobody makes me do anything. I’m my best friend and my worst enemy,” she confessed. In the interview, she admitted that drug use brought her close to death’s door. “I got as close as it gets, but I know people who have come closer,” she said. Then Houston opened a small window to her faith. “I pray every day,” she said. “I’m not the strongest every day but I’m not the weakest either,”Houston said. “Pray for me as a person,” she implored, “pray for my soul, that I’m stronger. I know I’m a child of God and I know He loves me. 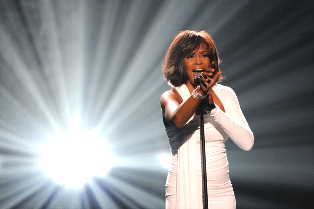 BEVERLY HILLS, CA – Singer Whitney Houston was found dead Feb. 11, in the Beverly Hilton Hotel, Calif., after emergency medical personnel were called sometime Saturday, said the sources, who asked to remain anonymous because the investigation is ongoing. According to the Los Angeles Times, Houston, 48, was in the Los Angeles area for a musical tribute to music executive Clive Davis and had performed and spoken to reporters earlier in the week. Among her many hits were: “How Will I Know,” “Saving All My Love for You” and “I Will Always Love You.” She won multiple Grammys including album and record of the year. “The performer had drug and alcohol problems for years, and in May her spokeswoman said she was going back to rehab,” said the LA Times story. Singer Whitney Houston died Saturday in a Beverly Hills hotel. She was 48. Fox News reported that the Beverly Hills Police Department responded to an emergency call at the Beverly Hilton Hotel Saturday, Lt. Mark Rosen, of the Beverly Hills Police Department said. “To hear this young girl breathe such fire into this song. I mean, it really sent the proverbial tingles up my spine,” he added. Before long, the rest of the country would feel it, too. Houston made her album debut in 1985 with “Whitney Houston,” which sold millions and spawned hit after hit. “Saving All My Love for You” brought Houstob her first Grammy, for best female pop vocal. “How Will I Know,” “You Give Good Love” and “The Greatest Love of All” also became hit singles. Her decision not to follow the more soulful inflections of singers like Franklin drew criticism by some who saw her as playing down her black roots to go pop and reach white audiences. The criticism would become a constant refrain through much of her career. She was even booed during the “Soul Train Awards” in 1989. “At her peak, Houston was the golden girl of the music industry. From the middle 1980s to the late 1990s, she was one of the world’s best-selling artists. She wowed audiences with effortless, powerful, and peerless vocals that were rooted in the black church but made palatable to the masses with a pop sheen,” said Fox News. Neil Portnow, President/CEO of The Recording Academy said in a statement, “Six-time GRAMMY winner Whitney Houston was one of the world’s greatest pop singers of all time who leaves behind a robust musical soundtrack spanning the past three decades. “Her powerful voice graced many memorable and award-winning songs. A light has been dimmed in our music community today, and we extend our deepest condolences to her family, friends, fans and all who have been touched by her beautiful voice,” he said. Fox News added, “Some saw her 1992 marriage to former New Edition member and soul crooner Bobby Brown as an attempt to refute those critics. It seemed to be an odd union; she was seen as pop’s pure princess while he had a bad-boy image, and already had children of his own. The couple had a daughter, Bobbi Kristina, in 1993. Over the years, he would be arrested several times, on charges ranging from DUI to failure to pay child support. Now Whitney Houston has left us with memories of the great days when at her peak in the 1980s and ’90s, Houston was the golden girl of the music industry and one of the world’s best-selling artists. Once again it appears that substance abuse may have taken the life of another great performer. 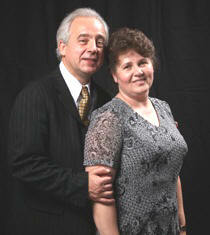 Voytovich, who is also the President of God Heals Broken Hearts Ministries (www.godhealsbrokenhearts.org/), movingly told the story of how his wife, Lyubov, who was 32 at that time, first discovered she had a lump in her breast. there,” he said. “She went to have it checked out and the doctors, who had not yet discussed surgery, started her treatment with chemotherapy. It was then that I felt prompted of the Lord to pray for her complete healing. “At that time, she felt a pressure in her throat and chest and she was so scared that she was dying and yet here we were all praying for her healing. She felt so bad and, at that time was not even praying, just crying. “However, our prayers were so powerful that, after asking for her healing, we started to thank God for His answer. Then my wife said that in the background she heard a voice that said, ‘BELIEVE.’ She then asked what she had to believe, as she wasn’t even praying or asking about anything. “She heard us thanking God for her healing, and so she asked God: ‘Do I have to believe that I am healed’ and she heard the reply, ‘Yes!’ After our prayer we knew that she had been healed and were so happy about the miracle. I asked my wife to check to see if the lump disappeared, but she was not ready at that time. We waited for few days and then went to see the lady doctor who had initially diagnosed her. I was able to observe the change on the doctor’s face when she couldn’t find anything. Besides his pastoral work at the Full Gospel Church in Dunedin, Florida, he also works at the local Health Department and his wife is an RN at Largo Medical Center. “In our church we have 150 members (Russians and mainly Ukrainians, with some Polish, Hispanic and English people,” he said. Attendees of the Fort Worth Christian Women’s Connection luncheon will be treated to a feisty guest speaker, a good meal, and an opportunity to donate to a worthy cause. During the organization’s February luncheon, women are invited to bring new teddy bears or other types of stuffed animals to the event for MISSION 3:16, a chaplaincy at Kimbo Juvenile Justice Center. The luncheon will take place from 11:30 a.m. to 1 p.m. on Feb. 15 at the Mira Vista Country Club, 6600 Mira Vista Blvd in Fort Worth. The cost is $17. The mission donates a stuffed animal – or Prayer Bear – to a patient at Cook Children’s Medical Center in Fort Worth every time one of the Kimbo kids earns a certificate for being on Level 1 behavior for seven consecutive days. The stuffed animals must have the store tags still attached. Since November 2002, Kimbo Juvenile Justice Center has donated “Prayer Bears” to Cook Children’s Medical Center on behalf of detainees maintaining the highest level of behavior. The scheduled guest speaker for the February luncheon is Qujette Cone, a fun-loving grandmother, who will take attendees on a journey of her heart’s travels in “Music From the Heart.” Jimmie Porterfield will accompany Cone on her musical journey. In addition, Ryan Loehndorf will showcase the variety of pampering at Moda’s Aveda Salon on Seventh Street. Childcare is provided. All reservations, and cancellations, including childcare, must be made by Feb. 10. Email Patsy at fortworthwomensconnection@yahoo.com for reservations. The church-work gap emerges in data from two surveys commissioned by the Center and conducted by the Barna Group. The LeTourneau Center for Faith & Work, founded in 2011, reflects a burgeoning “faith at work” movement to help the employed — and unemployed — find God beyond church doors. The Center’s web site assembles resources, tools, and curriculum for churches, students, and the global Christian community to equip and connect them to live out their faith in the workplace. Foundational to the Center is the notion that God values good work well done. In 1946 R.G. LeTourneau, industrialist and inventor, founded LeTourneau University; and his refusal to separate faith and business formed “the DNA of the university.” Bill Peel, founding executive of the university’s Center for Faith & Work, is an award-winning author of seven books, including Workplace Grace, What God Does When Men Lead, and Discover Your Destiny. Record company and Christian music publishing veteran Ed Kee has created a way for churches to minister to the unchurched Broadway style. 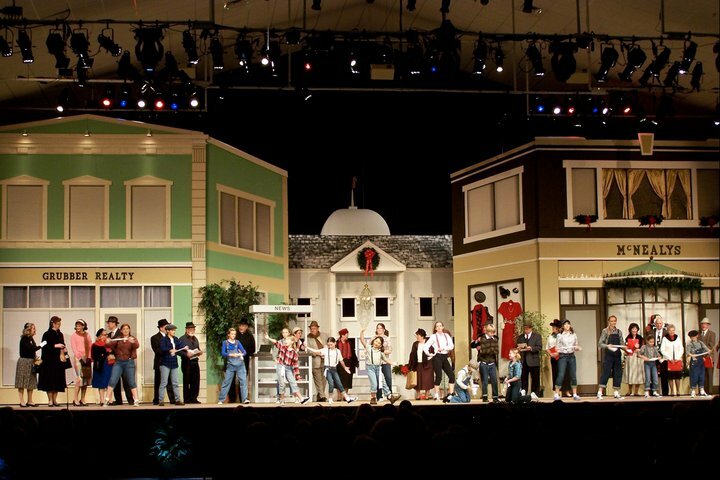 Church Musicals' production of "Humbug"
non-threatening outreach tool as well. Founded in 2003, the vision for Church Musicals began when Kee, as creative director for Brentwood Records, would go to New York and see Broadway musicals. Kee said Christian Musicals allows churches to minister to the unchurched without losing them in “Bible-thumping” rants or “church-speak,” something they do not readily understand. “The goal is to entertain and demonstrate God’s love at the same time,” Kee said. Kee said more churches are discovering Broadway-style musicals are an effective outreach to the community. “It gets people into the church where relationships can be formed and where the gospel can be shared,” Kee said. “One essential component, however, is quality. The stereotypical picture of a ‘church musical’ involves people in bath robes and sandals. Unless you provide high quality entertainment, people aren’t likely to come,” he said. For those churches that do musical theater, the available repertoire has been slim to non-existent. The large Christian Music publishing companies have – with a few notable exceptions – made rather feeble attempts in recent years at creating musicals for this market, but have now abandoned it altogether because of its niche appeal. Kee is a staunch believer in niche marketing and in the power of this medium for communicating the gospel. His goal is to be the “go to” company for Broadway style musicals. Kee is also in the process of writing and developing other original musicals for release later this year and early 2013. A pastor, his wife, and teenage daughter were among the 10 people killed in a massive highway pileup in Florida, now deemed as the deadliest crash on an American highway in 20 years. According to CBN News, pastor Jose Carmo, Jr. and his family from the International Church of the Restoration in Atlanta were returning from a religious conference when their vans collided with several cars, six tractor-trailers, and a motor home on Interstate 75 near Gainesville on Sunday. Senior pastor Arao Amazona told CBN News he had opted to delay his departure until the next morning. Amazona said Carmo had wanted to be back in time for the suburban-Atlanta church’s Sunday morning service. “We couldn’t have imagined such tragedy would come to us,” Amazonas said. The crash took place after the Florida Highway Patrol reopened the interstate following an earlier serious accident. The broadcast outlets said the highway had earlier been closed due to thick smoke from a fire alongside the road which hampered visibility for drivers, according to broadcast reports. “We went through the area. We made an assessment. We came to the conclusion that the road was safe to travel and that is when we opened the road up,” said highway patrol spokesman Lt. Patrick Riordan during a news conference. The crash’s 18 survivors were hospitalized. Some are still in critical condition. The University of Alabama-Birmingham Gospel Choir is celebrating Black History Month in a special way this year, with a song that honors the memory of the four little girls who lost their lives in the 16th Street church bombing in 1963. The track is available for download at iTunes, Amazon.com, Cdbaby.com and Myspace Music. Local, national and satellite radio stations, secular and gospel, will all have copies for radio play, Turner said. Comedian, radio host, and Birmingham native Rickey Smiley will debut the song to his national audience, as well. “This is perfect timing as we celebrate the service, sacrifices and achievements of the Civil Rights Movement, including those of the Foot Soldiers, the Freedom Riders and the children who died during this time in American history,” Turner said. “This song gives voice to the children who did not survive attacks during the Civil Rights Movement.” The timing of the release coincides with Black History Month and national observations of historic anniversaries and events, including the opening of the Martin Luther King Jr. Memorial and the 50th anniversary of the Freedom Riders. 2011 was a banner year for the choir, with its first overseas tour to London and Birmingham, England and Amsterdam, the Netherlands, two CD releases, an East Coast tour, a live performance on NBC’s “Today” with Al Roker on the campus of UAB to 5.5 million viewers, and the special recognition they gave to local heroes of the Civil Rights Movement who recently passed away by presenting the “Gospel Anthology II” concert. Turner also was honored by the Carlton Reese Memorial Unity Choir, the original Civil Rights mass movement choir.